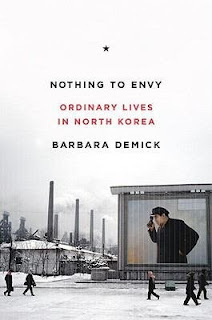 Barbara Demick's "NOTHING TO ENVY - ORDINARY LIVES IN NORTH KOREA" is a fascinating and gut-wrenching retelling of the life stories of North Korean refugees now living in South Korea, all interviewed over the course of several years by Demick, a Los Angeles Times journalist. More than the many articles I've read about the "Democratic People's Republic of Korea", aka North Korea - and certainly more than BR Myers' disappointing "THE CLEANEST RACE" , which I read last year - this book provides the deepest and darkest look into what it is actually like to live under the thumb of one of the most represssive dictatorships in history. Demick does an amazing job tracking the painfully slow illumination that allowed these six individuals to realize that they'd been lied to their entire lives, and what it took for them to make the final, risky and exceptionally dangerous decision to defect and leave their country. There's really only one way to get information out of North Korea anyway, and this is it. The book gives a skeletal but necessary overview of how the Kim Il-Sung regime came to be after the 1950s Korean War, and how the regime was able to stay propped up ("thrived" would be far too generous) by the subsidies flowing from other Communist nations like the Soviets and the Eastern European nations. After 1989, however, the DPRK became one of only two truly full-Communist nations on the planet, with Cuba being the other. Without the support of its benefactors, and with little in the way of natural resources to exploit and trade, North Korea endured mass starvation to the point where a conservative estimate is that 1 out of every 5 of its citizens starved to death in the 1990s. Demick interviewed her six defectors multiple times, and paints a picture of their life before, during and after this hell. It's easy to look at starvation as an abstraction, and since no news actually makes it out of North Korea. It certainly has been nearly impossible to look at North Koreans living under the jackboot as individuals. But Demick does more than humanize them; she paints exceptionally vivid pictures of love lives, work lives (most of which imvolved being forced under penalty of labor camp to go to work for no paycheck during all of the 1990s) and family lives - as well as of the learned survival skills needed to find food when there is none. The descriptions of starvation itself are harrowing and horrific. One interviewee, Mrs. Song, lost both her husband and her only son to starvation, and barely avoided death herself. As in the survival stories from Auschwitz, North Koreans were reduced to stealing from each other and to feigned ignorance of the suffering going on outside their own families - and were then wracked with guilt when things (barely) eased up. There is evidence that it hasn't eased up at all, however. Is there a famine going on in the country right now? No one knows for certain, but if not for China's heartless and relatively recent policy of aggressively hunting down refugees and returning them to North Korea, there's no doubt in my mind that the latter country would be emptied out in short order, which is exactly what the DPRK, China and even South Korea fear. So a sort of surreal and horrible stalemate is in place, with real lives hanging in the balance. That's the detail that this book provides in spades - a sense of the real people who are trying to make sense of daily life in North Korea, while having no idea of what life might be like outside of it. Highly recommended for fans of the human race.